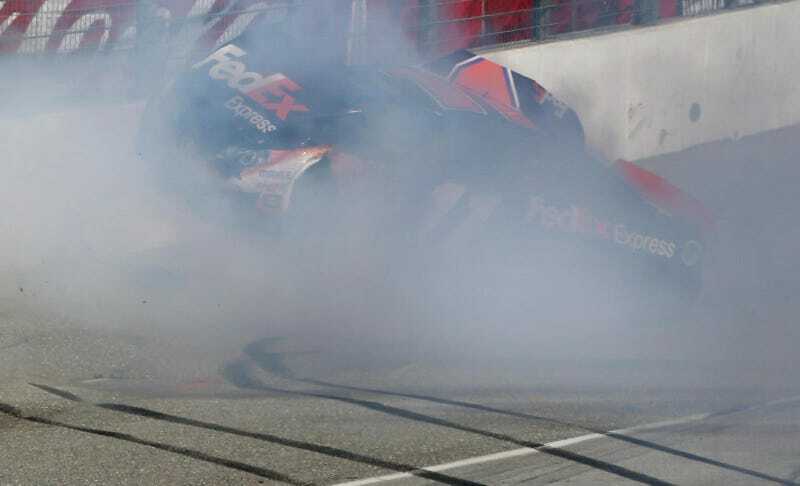 After his dramatic last lap wreck in yesterday's NASCAR Sprint Cup Series race at Auto Club Speedway, it seems that Joe Gibbs Racing driver Denny Hamlin has been left with a broken L1 Vertebrae, and as of right now is still in the hospital. When he returns to North Carolina he will see Dr. Jerry Petty, who will decide how the issue will be treated and whether or not he can get back in a car in time for the NASCAR Cup Series race at Martinsville in two week's time. There is some precedent for vertebrae injuries in recent years, mostly in the IZOD IndyCar series, but it's clear that each case unique and, while these examples can give us a good idea of the extent of the injury, they most certainly don't tell us about Hamlin's case in particular. In 2011, Will Power fractured a vertebrae in the IZOD IndyCar Series race at Las Vegas Motor Speedway. He was approved to return to a race car just four weeks later. Also in 2011, Justin Wilson fractured a vertebrae in IZOD IndyCar Series qualifying at Mid-Ohio. He missed the remainder of the 2011 season (two months) and returned for 2012 testing. In 2003, Dario Franchitti fractured an L1 vertebrae (the same one that Hamlin fractured) in a motorbike crash on the roads of Scotland. Unlike the racing related issues for Power and Wilson, this fracture required surgery, and Franchitti was out of the car for a full nine months. Thanks to NASCAR's playoff system ("The Chase"), Hamlin could still contend for the Sprint Cup Series title even if he misses a few regular season races, but he'd need to get back in the car relatively quickly. However, it's important to reiterate that the specifics of his injury are still not known, and thus we still do not know if he will miss races or not. Martinsville is both Hamlin's home track and his statistically best track. Recent from porsche9146, 98 forever.